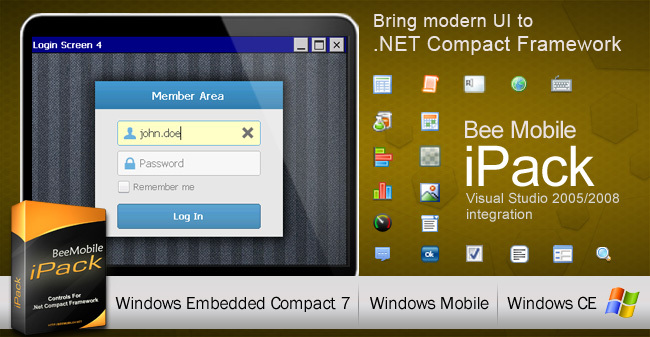 Bee Mobile iPack Package of .NET Compact Framework controls for Windows Mobile and Windows CE. 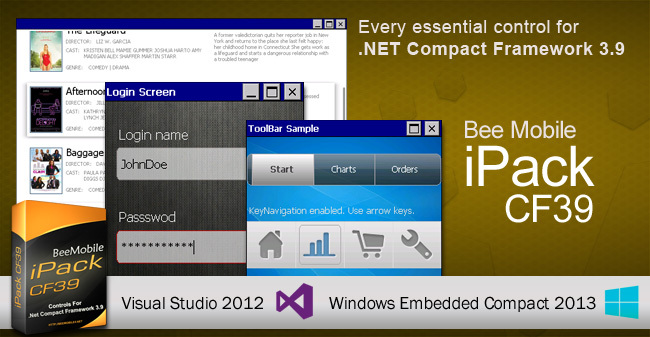 Bee Mobile iDesk Create iPad-like GUI in your Windows Forms application with Bee Mobile iDesk. 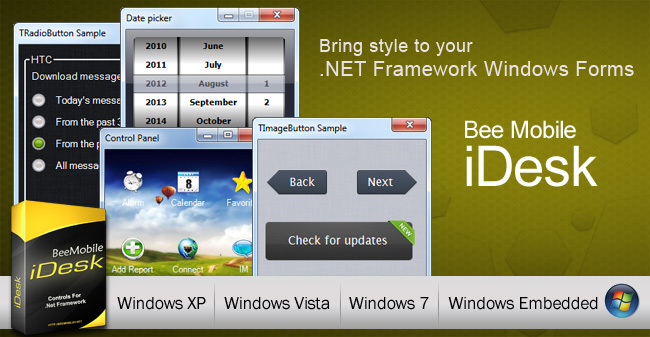 Bee Mobile iDesk is a pack of .NET Framework controls that transforms your Windows Desktop application into stylish and modern user interface inspired by iPad. Components support a wide range of operating systems e.g., Windows 7 or Windows Embedded Standard. iDesk is fully supported by Visual Studio Designer that saves your time and costs. Put the dreams of your customers into reality with the help of Bee Mobile iDesk. Over 35.NET CF controls together in one package, all designed to launch your Windows CE applications to the forefont of software technology. The iPack combines elegant and modern visuals with intuitive finger-friendly interfaces to create an impressive user experience. Controls are fully supported by Visual Studio Designer, allowing you to visualize your design and cut down on the development time and cost of your applications. Bee Mobile iPack CF39 is a next generation of iPack controls targeting the new software platform .NET Compact Framework 3.9. They are designed to bring your application to a new visual level by implementing many powerful graphical featuers such as transparency, gradient-fills, PNG images, etc. Currently .NET Compact Framework 3.9 runs on Microsoft Windows Embedded Compact 2013 operating system environment. Utilization of Bee Mobile components in "Beacons for Windows Mobile" has significantly sped up the development of the application and made its accomplishment possible in the designated time frame. The components are very easy to use for the developer. Your software is great, I really like it. Probably the most thorough and well thought out third party code I have ever used! — Phillip Malawey, Update Systems, Inc.